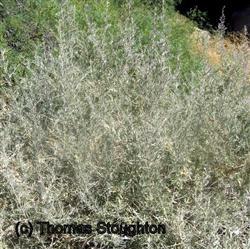 Four-wing saltbush is a species of evergreen shrub in the Amaranthaceae family, which is native to the western United States. It has a highly variable form, and readily hybridizes with several other species in the Atriplex genus. Its height can vary from 1 foot to 10 feet, but 2 to 4 feet is most common. The leaves are thin and 0.5 to 2 inches long. It is most readily identified by its fruits, which have four wings at roughly 90 degree angles and are densely packed on long stems. The fruit stem resembles a mass of corn flakes. Fourwing saltbush is most common in early succession areas such as disturbed sites and active sand dunes. It is also found in more mature successions dominated by sagebrush and shadscale. It becomes very drought tolerant after a few good waterings. The whole plant is edible. The seeds can be ground into meal, young shoots used as greens, burn the leaves and use the ashes as baking powder. A very good bird plant. They will defoliate under extreme drought. The salt they accumulate in their leaves allows them to extract water from the soil other plants cannot.They need to be under some form of water stress, either drought, salt, or salt spray.